Yves Saint Laurent spent most of his life in the spotlight of French fashion. Following Christian Dior’s untimely death in 1957, the 21 year old Saint Laurent suddenly found himself as Creative Director at one of the most elite houses in Paris. The luscious styles ushered in by 1950s-era Dior maintain the frequent descriptor of classic, and it is interesting to think of Dior’s hourglass silhouette in contrast to the powerhouse years of Yves Saint Laurent under his own label. This wrap skirt with dramatic side upsweep reflects a transformation of Saint Laurent’s lauded 1970s peasant-inspired fashions into something decidedly more contemporary. The multicolor print with green overtones is a sophisticated trompe l’oeil of woven plaid. Precise detailing gives the appearance of a course twill weave, which does not intend to deceive others into thinking you are wearing wool but rather impresses with its silky exactitude. Fully lined in dark red silk, the skirt gathers neatly into the waistband with more density and fullness at front. However, the overall fit is slim with the length falling to the ankles. A button and hook-and-eye is hidden at the left side, with an attached sash to secure the skirt’s closure. This Saint Laurent skirt wears beautifully with understated boots, but the earthy plaid and feisty drape of the side sweep also make it an excellent candidate for experimenting with other style stories such as grunge-chic. 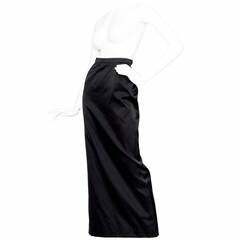 Size estimate: M Measurements: Waist: 28 Hips: 40 Length: 42 This 1990s era Saint Laurent Rive Gauche wrap skirt is in excellent condition, and has been professionally cleaned and pressed. The full length of the skirt is broken by a dramatic upsweep to the left side. In addition to a flowing side sash, a hidden button and hook-and-eye assist in securing it closed. The waistband sits at true waist with the fullness of the skirt expertly gathered into it. The wrap effect is accentuated by an increased density of gathers at the front waistband. The earthy hued fabric print mimics a twill woven plaid, offering a play on the luxury of fine wool and the refinement of silk. Lined in dark red silk. High-quality vintage pieces like this are yours to live in and love while increasing in value every year. It’s never too soon to start collecting them, as an investment in your wardrobe—and in yourself.